iFetch Too is an interactive, on demand ball launching toy perfect for any large dog who loves to play a good game of fetch. 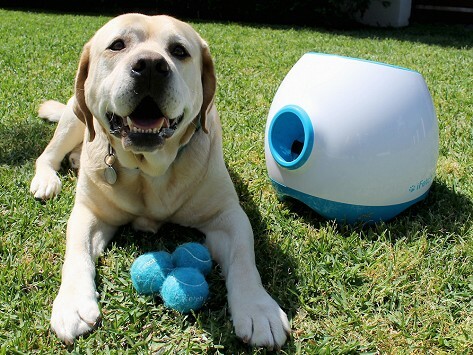 Train your dog to retrieve balls and drop them back into the iFetch for hours of fun. Dimensions: 17" x 16.5" x 14"
iFetch works GREAT - but my dog doesn't like it. The device works perfectly, no complaints at all. My Aussie, it turns out, is not so much obsessed with the ball itself as she is that she can use it to force our attention. The iFetch tosses it, she chases it, and insists on bringing it back to us. Get it. Got it. Good dog. Fido, meet iFetch—an interactive, on demand ball launching toy designed to let your four-legged friend play fetch without you. Whether you’re home or at work, inside or outdoors, iFetch is sure to entertain, exercise, and stimulate small to large, fetch-loving dogs for hours. 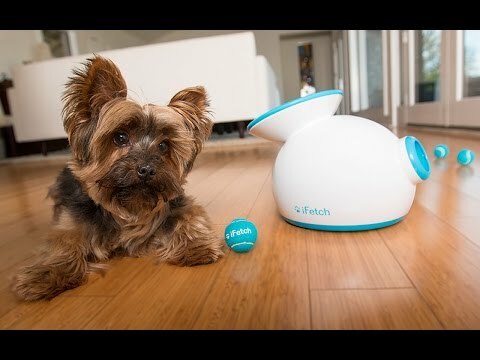 Denny and Grant Hamill, the grandfather and grandson team who created iFetch, say the real genius behind their product innovation is the family’s fetch-crazed toy poodle named Prancer. The idea came to Grant while trying to do his homework as Prancer nudged, pawed, and begged him to throw the ball over and over and over again. If only Prancer could play fetch without him . . .
With iFetch, when you’re ready for a break, Fido can keep on playing to his heart’s content.